Natural gas–a colorless, odorless, gaseous hydrocarbon–may be stored in a number of different ways. It is most commonly held in inventory underground under pressure in three types of facilities. These underground facilities are depleted reservoirs in oil and/or natural gas fields, aquifers, and salt cavern formations. Natural gas is also stored in liquid or gaseous form in above–ground tanks. Each storage type has its own physical characteristics (porosity, permeability, retention capability) and economics (site preparation and maintenance costs, deliverability rates, and cycling capability), which govern its suitability for particular applications. Two important characteristics of an underground storage reservoir are its capacity to hold natural gas for future use and the rate at which gas inventory can be withdrawn–called its its deliverability rate (see Storage Measures, below, for definitions). Most existing natural gas storage in the United States is in depleted natural gas or oil fields that are close to consumption centers. Conversion of a field from production to storage duty takes advantage of existing wells, gathering systems, and pipeline connections. Depleted oil and natural gas reservoirs are the most commonly used underground storage sites because of their wide availability. In some areas, most notably the Midwestern United States, natural aquifers have been converted to natural gas storage reservoirs. An aquifer is suitable for gas storage if the water-bearing sedimentary rock formation is overlaid with an impermeable cap rock. Although the geology of aquifers is similar to depleted production fields, their use for natural gas storage usually requires more base (cushion) gas and allows less flexibility in injecting and withdrawing. Deliverability rates may be enhanced by the presence of an active water drive, which supports the reservoir pressure through the injection and production cycles. Salt caverns provide very high withdrawal and injection rates relative to their working gas capacity. Base gas requirements are relatively low. Most salt cavern storage facilities have been developed in salt dome formations located in the Gulf Coast states. Salt caverns have also been made (by a process called leaching) in bedded salt formations in Northeastern, Midwestern, and Southwestern states. Cavern construction is more costly than depleted field conversions when measured on the basis of dollars per thousand cubic feet of working gas capacity, but the ability to perform several withdrawal and injection cycles each year reduces the per-unit cost of each thousand cubic feet of gas injected and withdrawn. 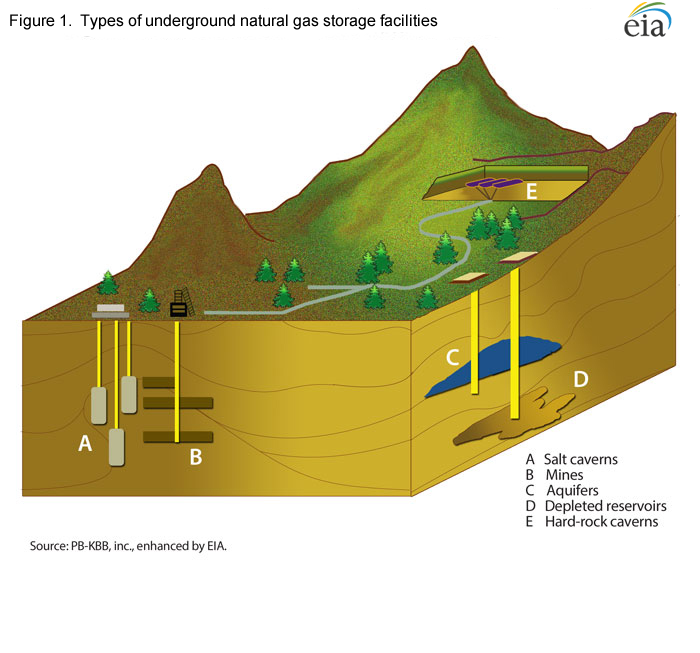 Figure 1 is a stylized representation of the various types of underground storage facilities. 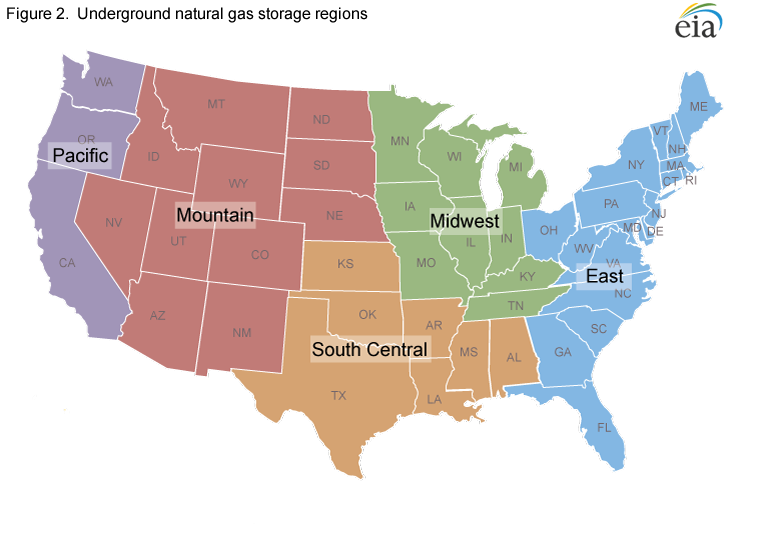 Figure 2 shows the U.S. natural gas storage regions. The principal owners/operators of underground storage facilities are interstate pipeline companies, intrastate pipeline companies, local distribution companies (LDCs), and independent storage service providers. About 120 entities currently operate the nearly 400 active underground storage facilities in the Lower 48 states. If a storage facility serves interstate commerce, it is subject to the jurisdiction of the Federal Energy Regulatory Commission (FERC); otherwise, it is state-regulated. Owners/operators of storage facilities are not necessarily the owners of the natural gas held in storage. In fact, most working gas held in storage facilities is held under lease with shippers, LDCs, or end users who own the gas. The type of entity that owns/operates the facility will determine to some extent how that facility's storage capacity is utilized. For example, interstate pipeline companies rely heavily on underground storage to facilitate load balancing and system supply management on their long-haul transmission lines. FERC regulations allow interstate pipeline companies to reserve some portion of their storage capacity for this purpose. Nonetheless, the bulk of their storage capacity is leased to other industry participants. Intrastate pipeline companies also use storage capacity and inventories for similar purposes, in addition to serving customers. The deregulation of underground storage combined with other factors such as the growth in the number of natural gas-fired electricity generating plants has placed a premium on high-deliverability storage facilities. Many salt formation and other high-deliverability sites, both existing and under development, have been initiated by independent storage service providers, often smaller, more focused companies started by entrepreneurs who recognized the potential profitability of these specialized facilities. These facilities are used almost exclusively to serve third-party customers who can most benefit from the characteristics of these facilities, such as marketers and electricity generators. Prior to 1994, interstate pipeline companies, which are subject to the jurisdiction of FERC, owned all of the natural gas flowing through their systems, including gas held in storage, and these companies had exclusive control over the capacity and utilization of their storage facilities. With the implementation of FERC Order 636, interstate pipeline companies were required to operate their storage facilities on an open-access basis. That is, the major portion of working gas capacity (beyond what may be reserved by the pipeline/operator to maintain system integrity and for load balancing) at each site must be made available for lease to third parties on a nondiscriminatory basis. Today, in addition to the interstate storage sites, many storage facilities owned/operated by large LDCs, intrastate pipelines, and independent operators also operate on an open-access basis, especially those sites affiliated with natural gas market centers. Open access has allowed storage to be used other than simply as backup inventory or as a supplemental seasonal supply source. For example, marketers and other third parties may move natural gas into and out of storage (subject to the operational capabilities of the site or the tariff limitations) as changes in price levels present opportunities to buy and store natural gas when demand is relatively low, and sell during periods of peak-demand when the price is elevated. Further, storage is used in conjunction with various financial instruments (e.g., futures and options contracts, swaps, etc.) in creative and complex ways in an attempt to profit from market conditions. Reflecting this change in focus within the natural gas storage industry during recent years, the largest growth in daily withdrawal capability has been from high-deliverability storage sites, which include salt cavern storage reservoirs as well as some depleted oil or natural gas reservoirs. These facilities can cycle their inventories–i.e., completely withdraw and refill working gas (or vice versa)–more rapidly than can other types of storage, a feature more suitable to the flexible operational needs of today's storage users. Since 1993, daily withdrawal capability from high-deliverability salt cavern storage facilities has grown significantly. Nevertheless, conventional storage facilities continue to be very important to the industry. The U.S. Energy Information Administration (EIA) collects a variety of data on the storage measures discussed above, and EIA publishes selected data on a weekly, monthly, and annual basis. EIA uses Form EIA-912, Weekly Natural Gas Storage Report, to collect data on end-of-week working gas in storage at the company and regional level from a sample of all underground natural gas storage operators. The regions used for weekly reporting were formally the East, West and Producing regions. In October 2015, EIA increased the number of regions (Figure 2) and changed their names to better align the storage locations with the markets they serve and to provide more information to market observers and participants. Data from the EIA-912 survey are tabulated and published weekly at regional and national levels. The EIA-191, Monthly Underground Gas Storage Report,, collects data on total capacity, base gas, working gas, injections, and withdrawals, by reservoir and by storage facility, from all underground natural gas storage operators. Data derived from the EIA-191 survey are published at a state level on a monthly basis in the Natural Gas Monthly, with select data available at the field level in the Natural Gas Respondent Query System. The data shown in the Natural Gas Monthly include tabulations of base gas, total inventories, total storage capacity, injections, and withdrawals at state and regional levels. Total natural gas storage capacity is the maximum volume of natural gas that can be stored in an underground storage facility in accordance with its design, which comprises the physical characteristics of the reservoir, installed equipment, and operating procedures particular to the site. Total gas in storage is the volume of natural gas in the underground facility at a particular time. Base gas (or cushion gas) is the volume of natural gas intended as permanent inventory in a storage reservoir to maintain adequate pressure and deliverability rates throughout the withdrawal season. Working gas capacity refers to total gas storage capacity minus base gas. Working gas is the volume of gas in the reservoir above the level of base gas. Working gas is available to the marketplace. Deliverability is most often expressed as a measure of the amount of gas that can be delivered (withdrawn) from a storage facility on a daily basis. Also referred to as the deliverability rate, withdrawal rate, or withdrawal capacity, deliverability is usually expressed in terms of million cubic feet per day (MMcf/d). Occasionally, deliverability is expressed in terms of equivalent heat content of the gas withdrawn from the facility, most often in dekatherms per day (a therm is 100,000 Btu, which is roughly equivalent to 100 cubic feet of natural gas; a dekatherm is the equivalent of about one thousand cubic feet (Mcf)). The deliverability of a given storage facility is variable, and it depends on factors such as the amount of natural gas in the reservoir at any particular time, the pressure within the reservoir, the compression capability available to the reservoir, the configuration and capabilities of surface facilities associated with the reservoir, and other factors. In general, a facility's deliverability rate varies directly with the total amount of natural gas in the reservoir: it is at its highest when the reservoir is most full and declines as working gas is withdrawn. Injection capacity (or rate) is the complement of the deliverability or withdrawal rate–it is the amount of natural gas that can be injected into a storage facility on a daily basis. As with deliverability, injection capacity is usually expressed in MMcf/d, although dekatherms/day is also used. The injection capacity of a storage facility is also variable, and it is dependent on factors comparable to those that determine deliverability. By contrast, the injection rate varies inversely with the total amount of gas in storage: it is at its lowest when the reservoir is most full and increases as working gas is withdrawn. None of these measures for any given storage facility are fixed or absolute. The rates of injection and withdrawal change as the level of natural gas varies within the facility. In practice, a storage facility may be able to exceed certificated total capacity in some circumstances by exceeding certain operational parameters. The facility's total capacity can also vary, temporarily or permanently, as its defining parameters vary. Measures of base gas, working gas, and working gas capacity also can also change from time to time. These changes occur, for example, when a storage operator reclassifies one category of natural gas to the other, often as a result of new wells, equipment, or operating practices (such a change generally requires approval by the appropriate regulatory authority). Finally, storage facilities can withdraw base gas for supply to market during times of particularly heavy demand, although by definition, this gas is not intended for that use.